Eltham is located 25km north-east of the Melbourne CBD and according to the 2016 Census the population is 18,314. In the last five years property value in Eltham has increased by 50.5% (realestate.com.au) and is also a suburb of high rental demand due to the leafy green environment. 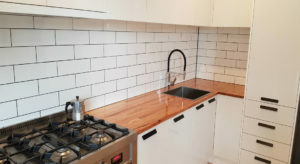 There’s no denying a renovated kitchen will increase the value of a home and provide a larger rental income so it was time for this family home to embark on a kitchen renovation. The DIY way was the alternative having a son who was handy on the tools meant the installation component was already covered. Like all our customers, budget is a main consideration thus started the research on diy kitchen companies. Kitchen Shack in Preston was ideally located for travelling and an in-store kitchen design was then booked. As the family would be saving on installation costs the Designer could design a kitchen adding some extras to stay within their budget. The brief included updating the kitchen into an open modern day kitchen with a mix of finishes, better workflow and increased storage. After discussing the family needs the Designer created an island bench knowing the kitchen flow would work easily in this space. A 3D version was produced so the customer could actually visualise their kitchen space and know they would be happy with the end result. At this time the island bench was a real winner seeing that that family and friends can pull up a set and chat with a glass of vino at hand. One of the favourite parts of this kitchen is the clever design of a hidden laundry. Tucked away behind the cabinetry is a second sink and storage for all your laundry needs. As seen the kitchen is now an individually designed space creating a modern oasis at a lower price than many other kitchens of this style. This kitchen design is becoming increasingly common with the standalone island bench and will look amazing for many years to come. The functionality and kitchen flow did not work for the family’s changed needs. The Excel Domain style handleless door is the perfect blend to the style of home. 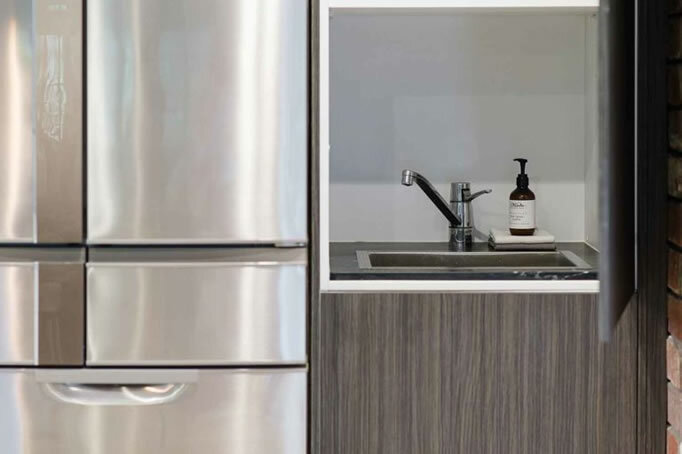 The Milano White style door and the glass splashback breaks up the darker cabinetry to create a bright, open space. 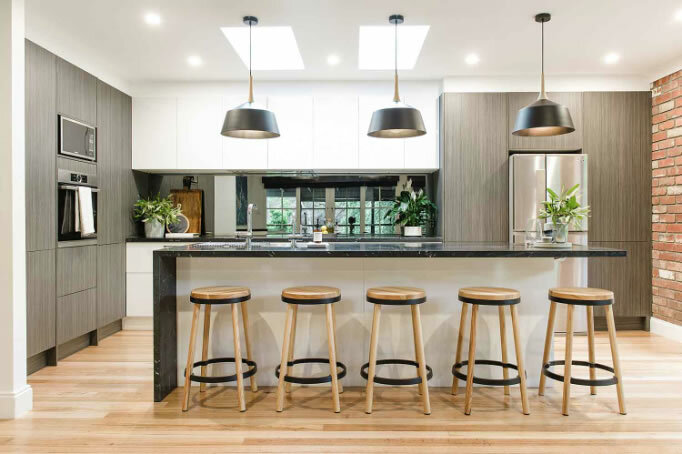 The final black benchtops, handles, lighting and island bench stools come together nicely to add the finishing touches to this modern delight. Do you want to see more of our flat pack kitchen transformations? 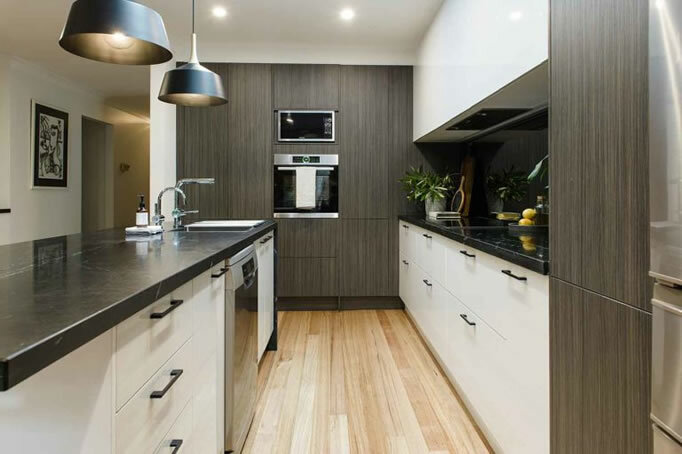 See our kitchen renovation project in Mill Park and DIY Kitchen Project in Wheelers Hill.